Native Trailblazers - "The Award-Winning Online Native Radio Show"
2017 Native Trailblazers Music Awards! CONGRATS 2014 JUNE JAMZ WINNERS! In June, Native Trailblazers has a month long series of shows highlighting today’s Independent Native Artists from every genre to include Folk, Hip-Hop, Country and Electronic and Traditional and more. After the shows which aired in June, Native Trailblazers listeners voted for their top five favorites. Dancing Elk, the number one artist, will receive airtime on a future segment of the show and promotional support. Since first airing in November 2009, Native Trailblazers celebrates hundreds of thousands of listeners and the show has been nominated in 2011 and 2013 for an Aboriginal’s People’s Choice Music Awards. 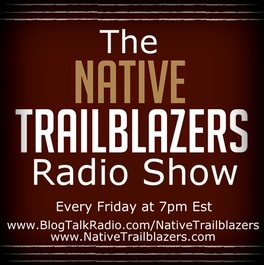 Native Trailblazers is on BlogTalkRadio, an online radio site that receives millions of visitors daily. We'll be listening to genres from today's independent Indigenous artists!!! We'll also be hearing from some of today's industry professionals about how to boost your music career! On the award-winning APCMA nominated BlogTalkRadio show, Native Trailblazers! Join show host Vincent Schilling (St. Regis Mohawk) an award-winning photojournalist, book author, public speaker & Executive Vice President of Schilling Media, Inc. as he interviews the true movers and shakers in Indian Country to include today’s hottest artists, entertainers, business leaders and key players in their industries. The show is also co-hosted by Delores Schilling, CEO of Schilling Media, Inc.